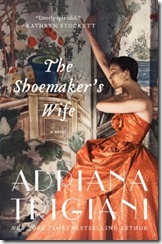 A few months ago, I had the pleasure of reading and reviewing Adriana Trigiani's new novel, The Shoemaker's Wife (read the review here). I truly enjoyed this book, as have the other people I know who have read it. I was contacted by Harper Collins Publishers to let me know that this title is coming out in paperback on August 21st. They are also offering one reader a free paperback copy! This giveaway will be open until 9pm Pacific Time on August 24th. To enter, please leave a comment telling me that last book that you read that you would recommend to other readers. Only one entry per person and, unfortunately, this giveaway is only open to readers in the United States. The last book I read was My Name is Memory. It was an intriguing premise and the flashbacks of past lives were really interesting. The Hunger Games series. I hardly ever read anymore! Hello Melinda -- It's nice to discover your blog through the Book Blogger Hop. I thought I'd also enter your giveaway since Adriana Trigiani is one of my favorite authors. I read a lot of "fluff" -- cozy mysteries, paranormal, etc -- many of which I would recommend to other fans of those genres. But when it comes to making a general recommendation, the one that I read most recently which I can heartily recommend is A Thread of Grace by Mary Doria Russell. Elsi - Random.org says YOU are the winner! Please email me at melinda(dot)d(dot)ott(at)gmail(dot)com with your address and I'll have that book sent out to you. My Great grandma was born in Italy. This story touched me deeply. I love the story of people making a life for themselves. Working hard and not waiting for handouts! This is what America was hard working people that had pride in their new country! I enjoyed so much!